San Diego Comic-Con is a part of summer that a lot of people look forward to every year and for obvious reasons. But it's not always fun for celebrities who have to move around thousands of fans to get to a panel or signing, so most stars choose some pretty interesting costumes to walk around anonymously without having to worry about getting bombarded by fan requests for pictures, autographs, or in Ben Affleck's case, to ask him what the heck is going on with The Batman movie. So, for this year's Comic-Con, Affleck decided to go with a pretty minimal disguise that may have come off as grouchy to all he encountered. It had been previously reported prior to Comic-Con that Ben Affleck was looking for any excuse to back out of the The Batman project, but the star showed up to a huge round of applause in Hall H for the Justice League panel, sort of putting those rumors down for a nap for the time being. But how did Ben Affleck get to the panel unrecognized or at least sort of unrecognized? The 6'4" Affleck showed up in an Oscar the Grouch t-shirt, which may have been more than a little telling about the actor's state of mind before heading to the panel, as well as some kind of scary children's mask that barely covered his face. The footage of Affleck walking around Comic-Con comes to us via Instagram user stang02mu and it features the Sesame Street shirt hardly containing all of the muscle that Affleck has while showing that quite a few people knew exactly who it was just by looking at the tall, muscular dude with the costume that he picked up from Walmart right before getting to the Con. Many stars have been able to pull off total anonymity while attending Comic-Con over the years. For instance, Henry Cavill showed up with a Guy Fawkes mask from V for Vendetta. In 2011, Justin Timberlake showed up with a writer as Ernie and Bert, which was pretty creepy, actually. But probably the best disguise of them all was Breaking Bad star Bryan Cranston who showed up in an awesome Walter White mask in 2013. Maybe Ben Affleck should take some notes from the aforementioned celebrities or maybe show up next year as the Christian Bale version of Batman. All jokes aside, Ben Affleck was seen at Comic-Con looking like he was having a delightful time interacting with fans and promoting the upcoming Justice League movie. Even if it is rumored to kill off Batman It's always refreshing to see an actor with a sense of humor taking on negative rumors and just out having a good time, because when it comes down to it, that's what it's all about: fun. While there is no concrete news about the status of The Batman, it is assumed that the new script is currently being written, but in the meantime, Justice League hits theaters in November for those fans looking forward to seeing Ben Affleck as Batman once again. 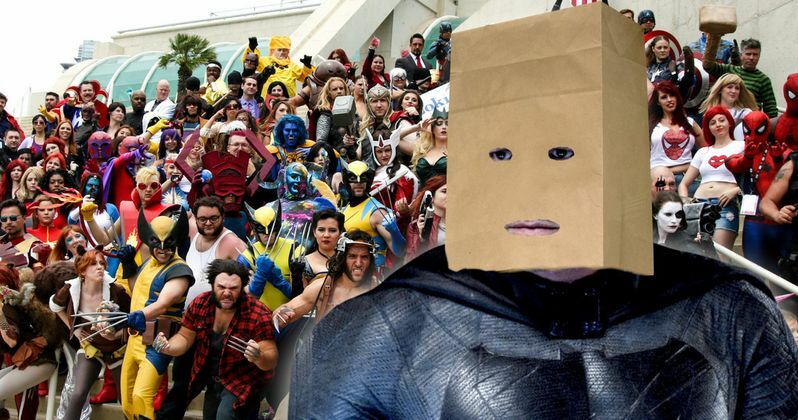 Check out Ben Affleck's Comic-Con disguise below.